Massie-Lofgren surveillance reform amendment fails despite bipartisan support. This Meaningful Surveillance Reform Had Bipartisan Support. It Failed Anyway. 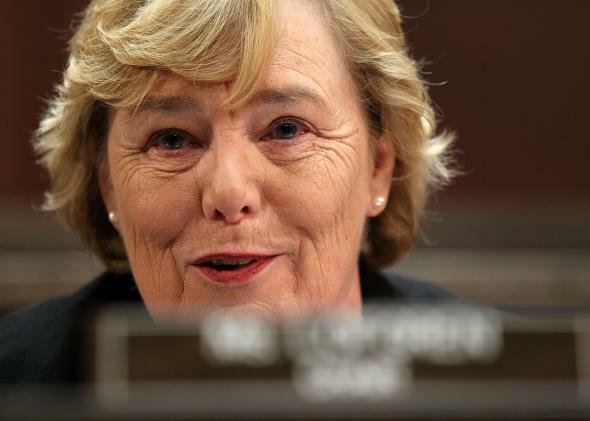 Rep. Zoe Lofgren, D-Calif., co-sponsored a surveillance reform amendment that, despite bipartisan support, will not become law. At a time when Americans are frustrated over legislative gridlock, Congress has outdone itself. Congressional leadership is has killed the rarest of birds: legislative reform of surveillance with overwhelming bipartisan support. At issue is an anti-surveillance amendment that passed the House of Representatives in June by a vote of 293 to 123—an overwhelming, veto-proof majority. It was the most significant post-Snowden reform to pass either the House of Representatives or Senate. Now, after ongoing secret leadership negotiations, it’s been switched out for a replicant that does little—if anything—but restate the status quo. The amendment would also have, via defunding, stopped the government from forcing companies to insert security vulnerabilities that make surveillance easier—no matter who is doing it. The amendment was written as a defunding because it was attached to the Defense Appropriations bill—generally considered a “must-pass” piece of legislation. Needless to say, activists were thrilled when the amendment made it through the House. Its reforms are particularly important given that the USA FREEDOM Act, another surveillance reform effort, failed to move through the Senate in November amid concerns that it didn’t do enough, sacrificed too much, and did too much. These varied disagreements show how extraordinary this amendment’s strength and success were—and why it’s so disturbing that secret dealing by leadership in Congress ripped the reform out of existence. The three representatives also introduced a bill last week that would accomplish some of what the amendment did, by prohibiting agencies from “mandat[ing]” companies change their products’ security for the purposes of making surveillance easier (outside of the Communications Assistance for Law Enforcement Act). That would be a good step for all of our privacy (and the tech industry’s bottom line), but it doesn’t include the ban on backdoor searches of Americans’ information, and it’s unclear whether it applies to non-mandatory agreements to weaken security, which we’ve seen before. Democracy-be-damned, leadership doesn’t want to enact any reform. So, even though both the Massie-Lofgren amendment and the 2015 Defense Appropriations Bill passed overwhelmingly through the House months ago, the Senate still hasn’t considered the measures, and right now it looks like this surveillance reform will never pass the finish line, even after winning the race. All of this is reminiscent of Rep. Justin Amash’s attempt to broadly defund bulk surveillance shortly after the Snowden leaks began. That measure failed at the finish line, 205 votes to 217. That failure came thanks almost entirely to aggressive, united lobbying by House Speaker John Boehner and House Minority Leader Nancy Pelosi. The Massie-Lofgren amendment also couldn’t be added to the CRomnibus because leadership’s procedural power also allows them to agree to bring bills up for consideration under closed rule, which prevents members from proposing amendments on the floor. Considering how contentious funding the government can be, that’s the expected path for the CRomnibus. The moral of the story? Surveillance reformers can’t succeed even when they have enough allies inside Congress to override the president, bolstered by allies on the outside from across the political spectrum. Not as long as party leadership remains the same.